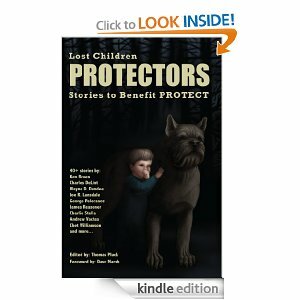 For me, it was never a question of whether or not I wanted to be involved in Lost Children: The Protectors. Protects’s fight is the fight. A single abused child is one child too many. Even the victims who escape the statistics (drug/alcohol abuse, incarceration, further victimization) can’t escape the scars. Abuse—whether mental, physical, or sexual—is not something a victim just gets over. I know this first hand. My wife’s mother and father have both been dead for over a decade now, and she’s still in therapy undergoing PTSD protocol due to their “parenting”. The only question I ever had was what to write. I began with an idea about a group of kids pulling off a complicated scheme to save an abused friend after all the adults failed to act. In my experience, adults turn their face from abuse for a litany of excuses: it’s not my business, it’s not my kid, who I am to tell someone how to raise their child, they’re just toughening them up, or I don’t want to make things difficult for me. Kids, until we ruin them, can usually see things for what they are—wrong. I wanted that idea to work, but the first several pages fell flat. The more I struggled, the more I bogged down in that negative headspace that leads to frustration, self-doubt, and writer’s block. So I scrapped it and moved on. But all my false starts led me back to some kind of scheme. I’ve always liked heist stories. Not so much the modern Oceans 11 variety that are all about beating computer codes, pressure plates in the floor, laser beams, and retina scanners. I don’t really go for the ones either that turn out to be some convoluted Xanatos Gambit involving a Spanish Prisoner, a Cat In A Bag, and a variation of the Fiddle Game with triple and quadruple-crosses. That’s all fun, but for me the meat of the story hinges on the character’s actions and choices, not my authorial cleverness. I’d had this idea in the back of my head for a while about a robbery at a university, a simple and straight forward theft with the promise of a big payday. It was the perfect bait for a thief like Mercer. In my story “Go Away,” Mercer is lured back to his hometown by a fellow ex-con offering to let him in on this potentially big money job. When he arrives, Mercer ends up facing a choice he didn’t expect. He can pursue the easy life he always wanted or he can help a young girl who reminds him of the sister who never escaped their father’s abuse. INACTION ACCOMPLISHES NOTHING. DO SOMETHING.